Swiss banking giant UBS has been fined €3.7bn (£3.2bn; $4.2bn) in a French tax fraud case. A court in Paris found that the bank had illegally helped French clients hide billions of euros from French tax authorities between 2004 and 2012. UBS said it had consistently contested any criminal wrongdoing and would appeal against the verdict. Following similar cases in the US in 2009 and Germany in 2014, the bank accepted large fines. As well as the fine of €3.7bn, UBS has also been ordered to pay damages of €800m payable to the French state. Last month, UBS said it made net profits of $4.9bn (£3.8bn; €4.3bn) in 2018. The bank has set aside $2.46bn to cover potential losses from litigation and regulatory requirements. The court found Switzerland's biggest bank guilty of illicit solicitation of clients and laundering the proceeds of tax fraud. The French prosecutors had previously told the court UBS was "systematic" in its support of tax-evading customers and that the laundering of proceeds from the tax fraud was done on an "industrial" scale. 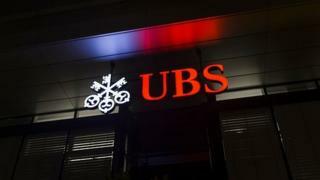 Prosecutors said UBS sent Swiss bankers to sports events and concerts to solicit clients. The court ruling follows an investigation lasting seven years. The bank had previously rejected a €1.1bn settlement offer. In a statement, UBS said it "strongly disagrees" with the verdict. "The bank has consistently contested any criminal wrongdoing in this case throughout the investigation and during the trial. "The conviction is not supported by any concrete evidence, but instead is based on the unfounded allegations of former employees who were not even heard at the trial." It added: "No evidence was provided that any French client was solicited on French soil by a UBS AG client advisor to open an account in Switzerland." Following a similar case in the US in 2009 UBS paid a settlement of $780m and in 2014 it agreed to a €300m fine in Germany.